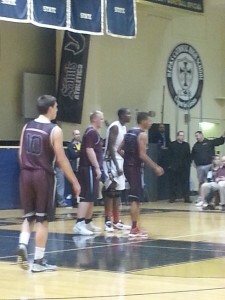 Berks Catholic played host to Gettysburg in Tuesday’s District 3 AAA first round matchup at Lloyd Wolf Gymnasium. The Saints, who were humbled by a loss to Wilson in the BCIAA championship, sought to reassure everyone that they were still legitimate playoff contenders. Meanwhile, the Gettysburg Warriors were seeking to pull an upset on the road. Coming into Tuesday’s battle, Saints center Nana Foulland needed just nine points to reach the 1000 career point plateau. The Saints jumped out to an 8-4 lead at the conclusion of a slow first quarter. Both teams shot the ball poorly during the first frame. After another slow quarter, which saw both teams post single digits, the Saints held a 17-10 halftime lead. The Saints held their opponents to 10 or fewer points at the half for the second time this season; the other coming January 16th against Schuylkill Valley. At the half, Foulland remained four points shy of the millennium mark. The third quarter proved to be pivotal for both squads. After converting on a field goal, Foulland was within two points of 1000. After a Gettysburg foul early in the third quarter, Foulland stepped to the line and was able to knock down both shots, giving him numbers 999 and 1000. 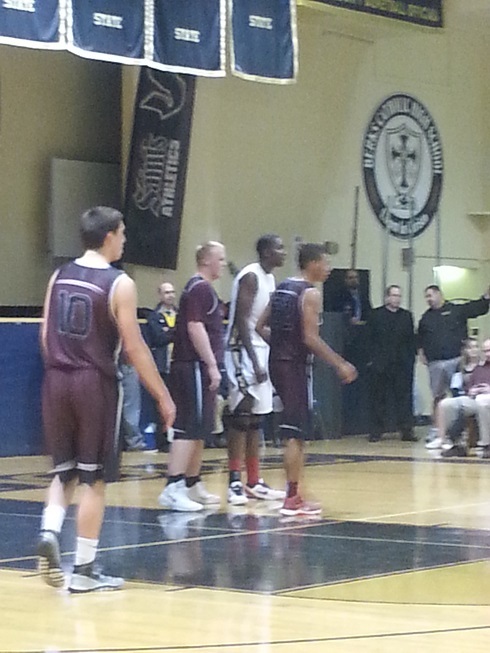 With the milestone out of the way, the Saints got back to playing their style of basketball and led 32-22 after 3. While the fourth quarter saw the Warriors climb to within four points with about five minutes left, the visiting squad would get no closer. Led by Nana Foulland (15 points, 8 rebounds) and Connor Jack (18 points, 8 rebounds, 5 blocks), the Saints would roll on to a 46-32 win. “This win feels amazing, but it’s back to work tomorrow. We don’t have very much time to prepare since we play again Friday, but you can count on us getting back to it.”, said junior forward Connor Jack. Jack, when asked what he thought about Foulland’s accomplishment, said “I’m so happy for him. It’s crazy. I’ve been by his side this whole time and he keeps getting better. He’s still improving every day and I’m definitely really proud.” When asked if he would be the Saints next 1000 point scorer, Jack just shrugged his shoulders and smiled. The No.4 seeded Saints will next be in action Friday night against No.5 Susquehanna Township in the District 3 AAA quarterfinals. The game will be played at 6 pm at Garden Spot High School. The Saints, who were short-handed due to a deep postseason football run, previously lost to Susquehanna Township 56-48 in their season opener. They hope with a full roster that the outcome will be different this time around.